Champhai, Jan 31 : Only one official consignment of goods has passed through Zokhawthar border trade route in Mizoram between India and Myanmar since its opening in 2004. The exporter was H.B. 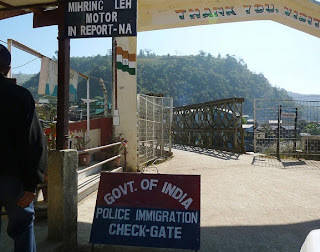 Manhleia, the then president of Importers & Exporters Syndicate, Mizoram. Asked why his inaugural consignment was not followed for furthering his business, Manhleia said many issues cropped up which were stumbling blocks for him and his colleagues. Customs officials told this correspondent that according to the Centre’s importing rules, any food or agricultural item will have to be issued a certificate of country of origin along with a phytosanitary certificate. The matter of phytosanitary certification, which is a must, could not be easily accessed earlier, but since March last year, the Centre has notified three officials for issuing it. However, till date no action has been taken by the state to set up a full-fledged office for the purpose at Zokhawthar. Besides, no full-scale trade can happen without proper roads on both sides, capable of handling trade traffic. At the moment, what is called border trade is only a variation of barter trade. Goods can only be brought across the border on carts or as headloads across the bridge on river Tiau. According to the official notification, these goods are mostly local agricultural produce. However, at the moment, the headloads carried across include all kinds of electronic items, textiles, utensils and appliances, packaged food items, fresh food, cigarettes, mostly of Chinese make, and livestock. None of these though are on the list of items permitted for official import through Zokhawtharbut. According to the customs officials, goods going out of India illegally through this sector include fertilisers, medicines and pseudoephedrine. Since the border is largely porous and unmanned, and can be easily crossed, preventing it is challenging. Despite fertiliser, pharmaceutical and life-saving drugs being on the permitted list of exports by the Indian government, bureaucratic hurdles between the two countries have led to illegal movement of these goods. According to local people, unless the government addresses these serious issues, only a small group of people would benefit illegally from whatever so-called trade that remains at Zokhawthar.